The other day I got a copy of Newsweek in the mail. I flipped through a bit, knowing what I would be seeing. I’ve been trying to avoid the news this week and simply keep to myself. I don’t want to relive what happened 10 years ago. I can still go right back to that day in a blink of an eye, as I’m sure most of you can do, also. As much as I wish I could forget that day, I do not want to FORGET what happend, and I want to pay tribute to those that personally suffered, and those that lost family and friends, and those that lost their lives. I chose to say a silent prayer today at about the time that all the sh*t went down so many years ago. It feels like a lifetime has gone by. I watched the painfully blue sky this morning, and heard a plane fly by…out of sight, but loud enough to add just the right touch to my remembrance. I have personal ties to the World Trade Center. I was proposed to at Windows on the World. I then had my wedding reception there. We spent our first night as husband and wife right across the street at the Millenium Hotel. We spent most of our dating years in New York City and visited the WTC every chance we could. When the towers fell 10 years ago, we chose to take a train down to Manhattan that following weekend and see what we could to help. We would have helped in any way possible, getting coffee, or delivering supplies, whatever…but there were so many volunteers at each street corner, we weren’t needed. We could only wander around and look at what was missing. The gaping, smoking hole glimpsed between the other buildings, or down a long, long avenue. The NYC skyline and our lives were forever changed. I don’t think we will ever recover. Whenever I see a clear blue sky in early September, I will remember. When a plane flies overhead, with the perfect white silhouette, and the loud drone of an engine, I will remember. Therefore, it is amazing to me that I have a son that knows nothing about this at all. He doesn’t know what the World Trade Center was. What it looked like. What it meant in his parent’s lives. What horror took place there. We’ve stayed in downtown Manhattan a few times with Jack. We’ve driven by Ground Zero many times. But we’ve never mentioned a thing. He’s too young. Someday, probably sooner than I wish, he will have questions that I will have to answer. As I was flipping through Newsweek, Jack saw a photo of the New York skyline which showed the Twin Towers in perfect clarity. I didn’t have the sense to close the magazine before he noticed. me: That’s New York sweetie. Jack: No it isn’t. What are those buildings? I never saw those! me: They used to be there, years before you were born. 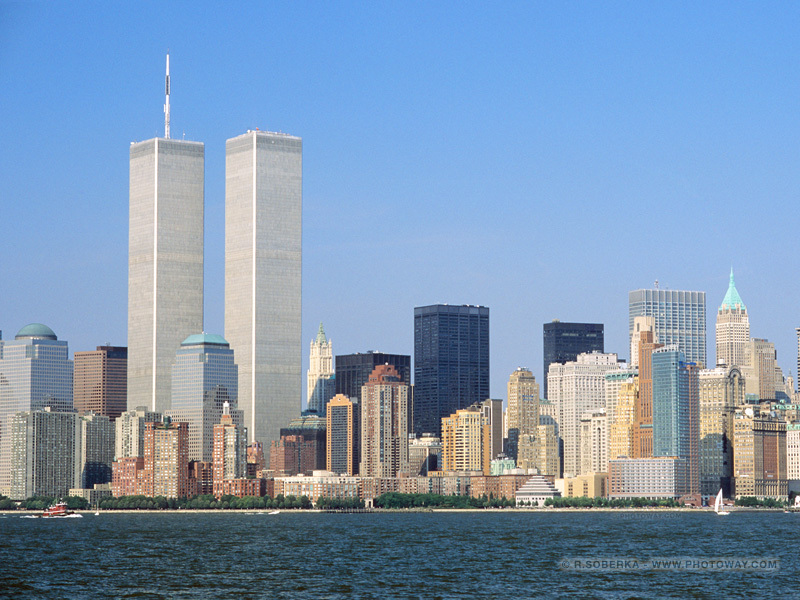 They were called the Twin Towers. See how they’re identical? Jack: Why are they not there now? Jack: Oh. Will they come back? Jack: Oh. Hey look, army guys on the next page. Cool! He really didn’t ask any more questions, so I got off the hook pretty easily. I will talk to him about it when he’s older. I know this because the World Trade Center and New York City are such a big part of our lives. It helped form us as a couple, and in turn, formed our little boy. Jack loves riding the train to the City and can handle the subway, taxis, lots of walking, and especially the hot dogs (!) like a pro. He’s not shy, has an attitude and talks really loudly, so he’s probably part New Yorker! 🙂 Jack will grow up loving the City just like his Mom and Dad. Eventually he’ll have to learn its past and deal with the tragic story of 2001. For me, it’s hard to believe that all of that history, and some of my history, was erased in a few hours on that gorgeous September morning. A fellow blogger, Amalie Flynn, summed it up amazingly in her personal account of the events that transpired that day. Be sure to read it all. Our thoughts and prayers are with everyone who was touched by the tragic events of September 11, 2001.